Lots going on this week at WORLD CLASS COACHING. We sent out a survey to all of our members so that we can send them exactly what they’re looking for in terms of coaching information. In exchange for the 60 seconds it takes to fill out the survey we gave them our latest eBook, ‘Modern Soccer Drills’ for free. If you’re a member you should have received an email about the survey and free eBook. If you’re not a member, you can become one and receive another eBook, ‘A Practical Guide to Tactical Periodization’ free of charge. Just click the link to register for it. I also started an Instagram account this week. You might not have thought about using Instagram to find drills and exercises but it’s a great way to share them. It has a huge advantage over twitter; you can post a much longer description on Instagram along with the image of the diagram. Every day we post a new exercise, interesting photo or thoughtful comment related directly to coaching soccer. You can find us @worldclasscoachingsoccer. 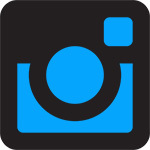 Please follow us there if you’re on Instagram already. If you’re not, you should check it out because there are some interesting people to follow there (also check out @433) that relate to what we do. This week I share some ideas for shooting and finishing activities that you can run indoors. You could use some of these activities either indoors or outdoors but they are more focused on the demands of the indoor game. I think you’ll find some ideas in this episode that you can use next week with your own teams. 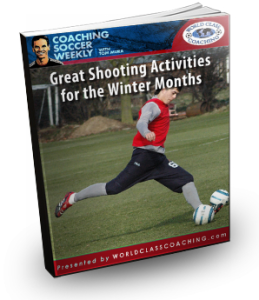 I had planned on this episode being focused on an indoor shooting and finishing session. But there are different indoor training environments. Some of us train in gyms while others train on indoor fields with boards around the outside. A lucky few have the opportunity to train in a large space with turf and goals. They can pretty much use any shooting session they would outdoors so I won’t be dealing with their situation. So I’m going to share my favorite exercises to work on shooting and finishing in gyms and indoor arena fields. Sure, there’s some that can be done in both environments but others are more specific to one or the other. Cones are placed at the base of a wall, three yards apart. There is a line on the wall that is three feet from the floor. The server takes the first shot. If the ball strikes the ball between the cones and under the line the next player takes one touch to control and then shoots. This continues until one player misses. The other player receives a point for every time his opponent misses. Each match lasts two to three minutes. The player with the most points moves one goal to the left. The championship goal is the one on the far left. The winner there stays to defend first place. As an alternative, you can have the winner move to the left and the loser move to the right. The key to this game is the rules. You must require the players to strike the ball properly each time. I say they must strike the ball with their laces and land on their shooting foot for the shot to count. If they do not, their opponent receives a point. This will focus the players on shooting properly rather than just kicking the ball at the wall. This episode of Coaching Soccer Weekly is supported by ZoomReports.com. If you’re a coach looking to give your players valuable feedback or a director of coaching searching for a way to manage the evaluations for your whole club you should try a free trial of ZoomReports by going to ZoomReports.com and entering the promo code CSW when registering for the free trial. Player A checks out, changes direction back and then passes to Player B who opens up and passes to Player C. Player A makes a diagonal run and shows for a give-and-go with Player C. Player A turns to follow the shot of Player C.
Player A takes Player C’s spot and Player C retrieves a ball and joins the line on the opposite side (Line 1). The same pattern is completed on the other side with Line 2. Player A checks out, changes direction back and then passes to Player B. Player A follows her pass while Player B dribbles inside. Player B then passes the ball back to Player A on the outside. Player B then makes a diagonal run to the corner to receive a parallel pass from Player A before playing a ball across the goal for either Player A or C to finish. Player A checks out, changes direction back and then passes to Player B. Player A follows her pass while Player B dribbles inside and passes to Player C.
Player C then makes a diagonal pass to Player A who has made a parallel run to the corner. 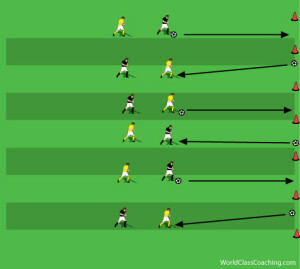 Player A then passes the ball across the goal for either Player B or C to finish. Next week I want to talk about breaking down and teaching the technical skills of the game. I’ll share what has worked well for me and what mistakes I’ve made that have changed the way I train my teams.